« Alcohol: Blessing or Curse? When he stated that, the Philadelphia era of the Church of God had started to rise up (the most faithful representation of the “body of Christ”), the Vatican officially came out against the millennial doctrine, and the one who is likely to be the final Antichrist may have been born (and one who was going to, in a major way, support a doctrine of Antichrist had certainly been). The stages for the final confrontation, which should occur in the 21st century, have been set. And that is a position that I also share. But he also seemed to promote the coming false ecumenical movement. I would caution all that apparitions, like Fatima (the site of the claimed “Miracle of the Sun”), were not actually appearances of Mary. Pope Francis appears to be the most ‘Marian’ pontiff, at least in my lifetime, and this may turn out to be a factor in Fulton Sheen becoming a Church of Rome saint. Francis added ANOTHER Marian holiday for the Church of Rome in 2018 as “Mary Mother of the Church” (see Another Marian holiday and Halos). More Marian pushing is expected. 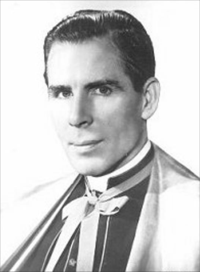 Presuming Fulton Sheen does get the final designation of sainthood by the Church of Rome, more will expect that a “Marian miracle” will one day be real and from God, presuming some related apparition many will claim to be Mary shows up. This entry was posted on Wednesday, September 26th, 2018 at 12:01 am	and is filed under Prophecy, Religious News.